We only have room for 2 more participants. This is the best way possible to get close to lots of snakes. We’re Only Accepting 2 more People for this Event (6 signed up)! It will be very warm in June for staying in the fan-only rooms in the Krabi Wilderness Resort. It will likely rain once per day on average, and this cools it down a bit. There are large mosquito nets above the beds at the resort. DEET 28 or higher is recommended to keep mosquitos away. 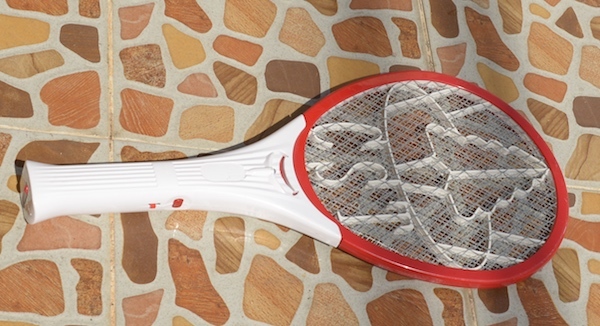 Bring or buy a rechargeable mosquito racquet for your bungalow! Don’t try to bring it on your flight – cannot! I will be in shorts, running shoes, and t-shirts all day – unless we’re herping. When herping I wear long lightweight pants tucked into my socks to keep the ants and termites out. I wear a t-shirt and a very lightweight long-sleeved shirt over top of that. I wear a hat with wide rim to keep mosquitos off my neck and head, and I usually wrap a snake-bag or towel around my neck to keep mozzies off me. The resort has a towel for each person in the room – but you might want to bring another. Wear long pants – loose and lightweight at least at night. During the daytime I usually wear shorts, but I spray my legs with DEET if there are mosquitos around. Pants should be long enough to tuck in to your socks. This keeps ants, termites, mosquitos, spiders, scorpions, and other wildlife off your legs. 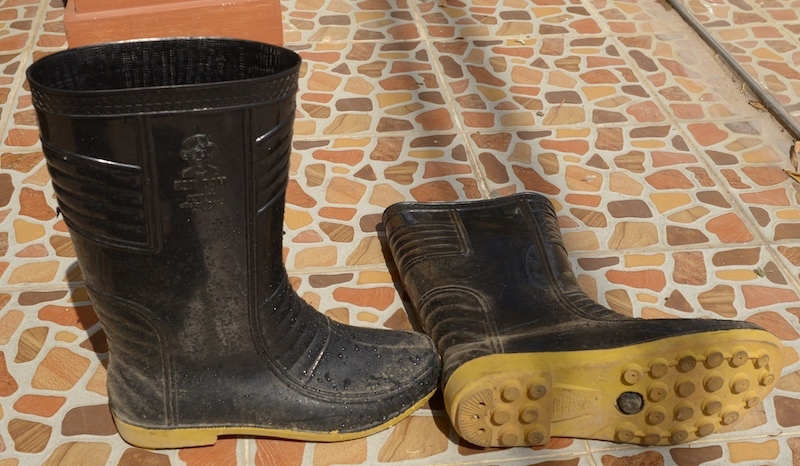 If you can, before you arrive, buy a pair of cheap (199 THB) rubber boots like those above. These are really durable, and have a good tread on the bottom. I buy mine a little big, but another guy I know recommends them to be snug. So, up to you. I found my boots at the little market in a place where they sell shoes. We can maybe get you a pair shortly after you arrive here if you really want them. During our field trips we do not go onto land with high grass or thick underbrush – so these boots are not really necessary. I wear socks and long pants with these boots – and I tuck my pants into my socks. Most of the time during this event I will wear running shoes. I am very careful watching for snakes before I take each step. In areas where we cannot see our own feet – it is essential to have boots to cover the feet, ankles and shins to protect from this snake. 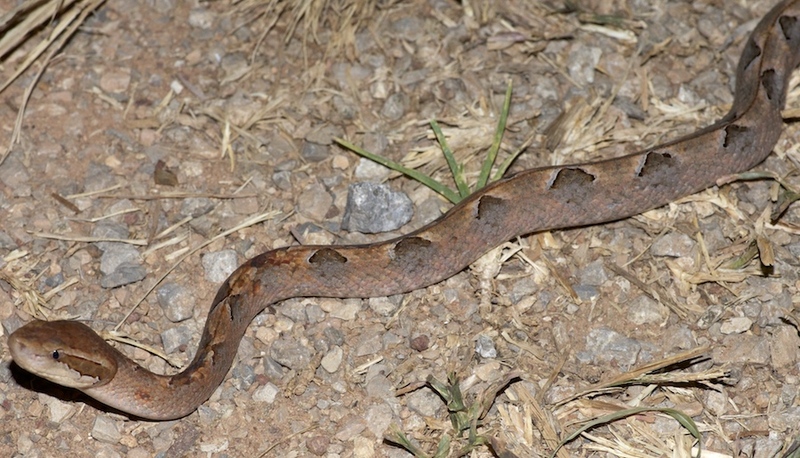 I have found scores of these snakes at the locations we’ll be going, so you need to be aware of them. This is one piece of equipment that you cannot afford to save money on. You can do it a couple of different ways. I use Petzl Headlamps. The batteries don’t last long, but I have some extras I bought so I can have 4-5 hours of good light. You should have at least 4 hours of strong light to look for snakes during our field trips. Recommended Headlamps: Petzl Tikka RXP or the REACTIK (2016 version), or the Petzl Nao 2 or Nao+ if it is available. Headlamps attract more bugs flying right into your eyes. I really don’t like that, and if there are many bugs at night I’ll just use the hand-held flashlights instead, or remove the headlamp and hold it in my hand. Some headlamps have non-removable batteries you cannot replace, and they only last 1-2 or even 3 hours. That is not long enough. Shoot for 4-5 hours of battery life. We carry a small first aid kit, but if there is anything else you need to ensure your good health – bring it. That includes Ventolin or other breathers, heart medicine, and every kind of medicine you require. Don’t rely on a Thailand pharmacy to have what you need in an emergency or after you arrive. Emergency Cash or Easy ATM Withdrawal. Have enough for hospital treatment ($2,000 USD recommended). The hospital will begin treatment without a large payment, but within a day or so they’ll start getting anxious. Probably best if you setup a Paypal or other account that can be used by friends back in your home country to Paypal us or other friends here payment for hospital costs as needed in an emergency. A Photographic Guide to Snakes and Other Reptiles of Thailand and South-East Asia by Cox et al. This book is helpful, and yet it is by no means comprehensive or error-free. It’s a small, thin book that is convenient if you have nothing else. I have seen them for $52-342 USD. They are NOT worth anything close to that. I bought mine for about $15 at this Thailand-based online store: DCOTHAI.com. I don’t see the book available there any longer. I saw online, a paperback for $30. Published in 2010. Not sure if they made any updates. Mine was published in 1998. Photos of Common Venomous and Non-Venomous Thailand Snakes. Covers some of the common snakes people are likely to find in Thailand. A Field Guide to the Reptiles of Thailand. By Cha-Nard, et al. I bought this as an ebook for $30 some dollars and I’d say it isn’t what I expected. It does have a lot of information, and is almost comprehensive in covering all snakes of Thailand, and the images (no photos) are easy to blow up and see in detail. Some of the images I’ve been very happy with. Others are lacking considerably. This is the best book on the market at the moment. We are keeping this to a maximum of 8 people for this 4-Day Event. Register quickly to reserve your spot. Minimum age for participants: 18. Registration is Just 19,000 THB per person and includes everything mentioned above. We’ll Collect the Rest at Check-in. The deposit is non-refundable after January 21, 2017.